News from our youngest son living in Canada determined that I should return home today rather than bagging the final two Berwyn Nuttalls and stopping off at Caravan & Camping Club's all year site at Oswestry, then driving home rested the next day. As part of my rehab I had declared that I would not walk then drive home the same day as I did last April since that was one of the reasons suspected of precipitating my bad back earlier in the year. However resting the previous day and being convinced driving home after walking was not a problem persuaded me to fit in the two short, separate walks to complete all 23 of The Berwyn Nuttalls. After 30 minutes through heather about as good as the path gets. Plan was a longer route starting near Milltir Gerrig further south along the B4391 which should have been easy walking along a permissive path to near the summit. 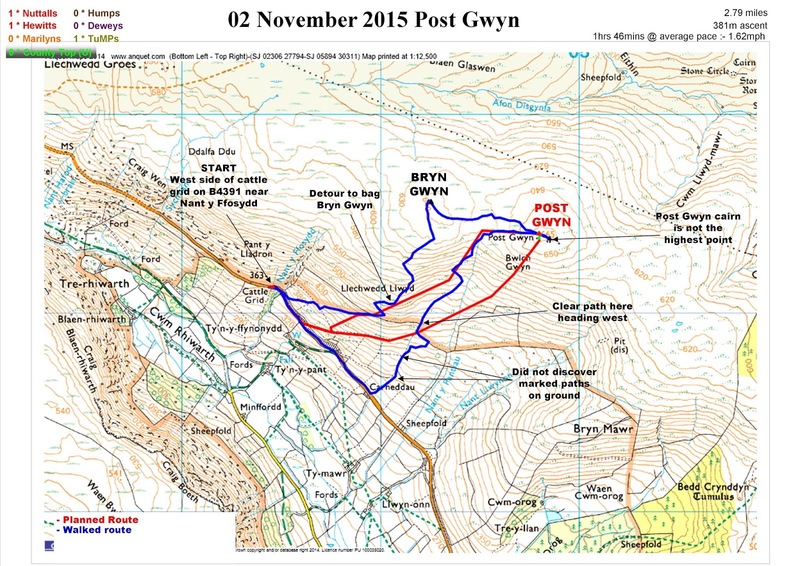 But just after driving over Pont Cwm Pydew I spotted off road parking about 1km before planned start point meaning dispensing with a 1km walk along the B4391 at the end of the walk and probably a similar amount on the ascent along the permissive path. A grass track marked the entry point from the B4391 but in no time it disappeared and the route became through calf deep heather all the way to the summit. The descent route was no different and although it was a bit harder it was definitely shorter and probably quicker than the planned route along the permissive path. On the day this was fine as it was a beautiful sunny day and navigation was easy simply by walking towards the high ground even though it was of course a false summit. Had it been cloudy there is no doubt I would have reverted to the longer planned route along the path. Second short walk of the day before driving home and although the beautiful sunny weather was continuing and the temperature was an unseasonal 20°C time was limited due to the shorter days. Even so I still had time to replenish energy with a proper lunch and hot cup of tea prepared in the van kitchen giving me at least 3 hours to do the 2 miles planned. 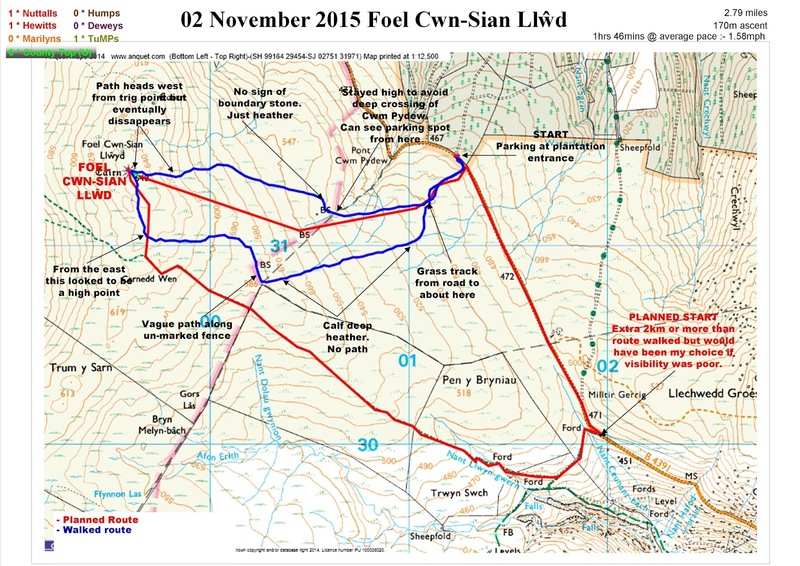 The ascent is steep right from the beginning and as you contour round Llechwedd Llwyd you see the target Post Gwyn straight ahead along with a green path through brown heather denoting a clear descent route from Bwlch Gwyn. Only problem at this point is the summit on you left looks deceptively higher no doubt because it is close. Not wanting to repeat missing an unplanned summit I left the path such as it was and headed off to the left towards the high ground. Turned out to be the ex-Nuttall top of Bryn Gwyn. No cairn or marker just heather but at least if I ever add ex-Nuttalls (unlikely) to my list of peaks I will not have to come back hear and more importantly have an extra summit to log this year. Bryn Gwyn out of the way it was an easy descent and reascent to Post Gwyn. One slight twist is that you head for the cairn thinking it is the summit. However if you had checked hill-bagging you would know it was the small pile of stones just west of the cairn. No matter I still went to the cairn then headed back over the summit and down Bwlch Gwyn towards the B4391.